Spring is a wonderful time to redo the children's bedrooms! Put away the heavy flannels and chamois blankets and get some new madras quilts with some light fun prints for spring and summer. Did you know that Pottery Barn Kids offers free room design with no pressure to buy? I loved having a designer come out to measure the rooms for the kids and design everything down to changing out the dresser knobs for pretty crystal ones. 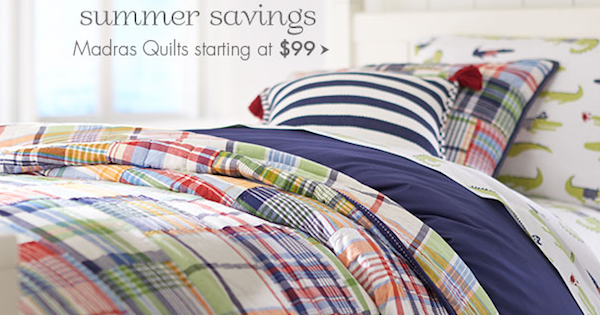 But - for a simple way to uplift the room - try some new bedding - it'll do wonders!